A multimeter is a basic tool of every electronics engineer. Unfortunately, not everyone can afford the expensive, professional meters. Oftentimes, novice electronics engineers and those that only dabble in electronics choose the cheapest, simplest multimeters available, only to quickly realise that those cheap devices do not offer the functions they need. However, purchasing an expensive multimeter is often not a good idea for novices, either. That is what makes the Axiomet AX-102 so interesting. The Axiomet AX-102 multimeter has basic parameters, but also boasts the most robust set of features available in its class, for a low price. Unlike the cheapest measuring devices that only let you measure AC or DC voltage, Axiomet AX-102 can also measure AC voltage and temperature. What's more, it can perform contactless voltage detection and live wire detection in electrical installations. 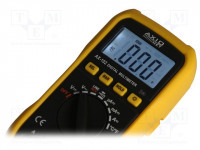 This makes it much more versatile than other multimeters in its price range. Axiomet AX-102 is 70x32x144mm large and weighs 200g (this weight includes its 9 volt battery). Looking at the device, the large, backlit, 4-digit screen located at the top portion of its housing immediately grabs your attention. It displays readings up to 2000. Below the screen, you will find four buttons and a dial for changing the device's operation mode. The bottom part of the enclosure has three measurement sockets. The middle socket is used for all measurements. The left socket, marked with an "A", is used when measuring stronger currents, while the right socket is used for other measurements. Additional features include automatic shutdown and overvoltage protection. This multimeter lets you measure DC voltage of up to 500V, AC voltage of up to 600V, direct and alternating current of up to 10A, resistance of up to 20MΩ, and temperatures ranging from -20 to +750°C. 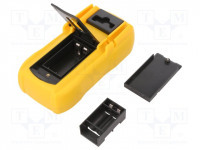 A K-type probe is used for measuring temperature – this probe and test leads are included with the multimeter. You can also test for circuit continuity which is indicated with a sound upon detecting resistance lower than 70Ω. To perform contactless voltage detection in a circuit, turn the dial to the "NCV" position and touch the tested circuit with the top part of the meter. The device will flash its LED and emit a sound when it detects voltage in a circuit. It should be noted that such measurements should only be treated as supporting measurements since many external factors can interfere with the operation of the device. Another interesting feature of this multimeter is the live wire detection function. To perform this operation, you must turn the dial to the "LINE" position, which is effectively the same as in previous example. Connect the black test lead to the "COM" socket, and the red one to the "VΩmA" socket. Hold the insulated part of the black lead and touch the tested wire with the red lead. If it’s a live wire, the meter will emit a sound and its red LED will turn on. To measure temperature, you just need to turn the dial to the "°C°F" position and connect the temperature sensor to the right sockets. Then move the tip of the sensor close to the point of temperature measurement and wait for the value on the display to stabilize. You can press the "SEL" button to switch between Celsius and Fahrenheit scales. 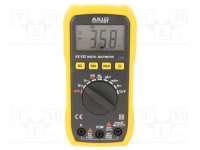 Portable digital multimeter The AX-102 multimeter from Axiomet is a great tool for novice electronics engineers and hobbyists, facilitating troubleshooting of all kinds of electrical problems. Temperature measurement, contactless voltage detection, and live wire detection functions make it much more advanced than other multimeters in this class. What's important, it complies with EN61010 CAT III 600V requirements, ensuring safe operation in all situations that electronics engineers and amateur electricians may encounter.